new Delhi. 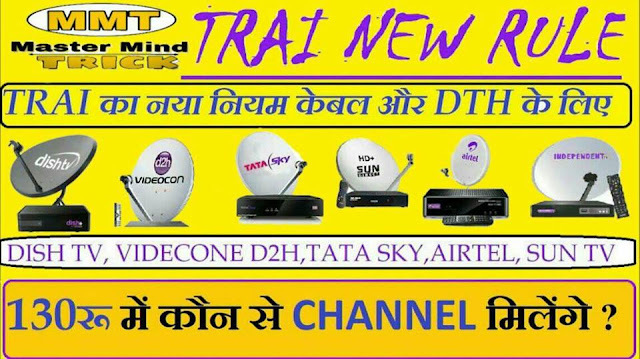 TRAI has issued new rules tightening the scam of cable operators and DTH companies. Now the more customers the customers want to see, they will have to pay the same amount. According to the new rules, DTH or cable operators will have to show 100 free-to-air channels in 130 rupees per month. This new rule has been implemented from December 29. In addition to the free-to-air channel, the other channel will have to pay the customers. If a customer wants to see the second channel other than the free-to-air channel, then they have to pay separately. Each channel will have an MRP in the electronic user guide. Channels can be expensive to charge more money. Legal action will be taken against those who violate the rules. This new rule will require a list of rates, which will be in the electronic user guide. In this, the MRP of each channel will be fixed. TRAI has made it clear that strict action will be taken against cable operators and DTH providers who ignore this rule. According to TRAI chairman RS Sharma, since the new rule, people will no longer be forced to install the package. What is Google and who made it? The arbitrariness of the cable operators will be felt and people can entertain themselves by spending less. Actually, so far it happens that you had to recharge a monthly plan of Rs 250 to Rs 300, and it contained many channels of your choice and dislikes. Apart from this, there were many favorite channels that you had to pay extra to see. But after the new rule of TRAI, no channel can be imposed on users. That is, users will have to pay for the same channel they want to see. After the arrival of this new arrangement, all the channels will be available in different or one book. Along with this, the user will also be told the price of each channel on the TV screen. Earlier it was said that your television service will be closed, but TRAI rejected it at the end. In the past, TRAI had said that the implementation of the new regulatory framework for broadcast and cable service would not disrupt the television service. Now TRAI has given the opportunity to customers to choose their favorite channels by January 31.